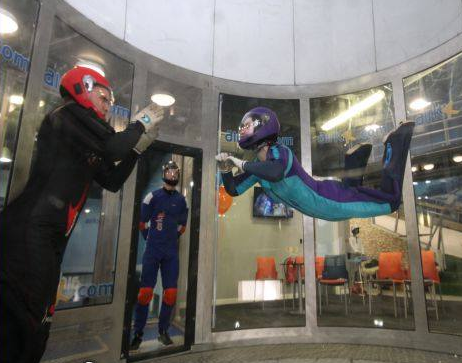 Indoor skydiving is growing in popularity. What’s more, it’s officially a world sport. The World Cup of Indoor Skydiving is now in its third year, with the next championship event scheduled at the revered wind tunnel in Bahrain in October 2018. Constructed with tempered glass, Bahrain’s indoor skydiving tunnel is one of the tallest in the world with an overall height of 12 metres. The sport is becoming more popular, and wind tunnels are popping up all over the world. Many skydivers use the tunnel as a way to learn and practice certain skills required during freefall before they have to put it in the sky. Intrigued? Why not give it a try? Why try an indoor skydive? The great thing about indoor skydiving is that virtually anyone can do it, from age 4 to 104! You get the same body flying sensation as doing the real thing. If you’re reading this and haven’t tried it, you quite simply must add it to your to-do list for thrills. It may be a cheat’s way to experience a skydive, but it does save you the anxiety of having to jump out of a plane. It’s also a much cheaper option and better for the environment (think of the plane fuel you are saving). And if nothing, it’s great fun to feel like you are flying like a bird without the worry of your parachute failing! For those who love the freedom of the sky, and are wanting to progress their formation skydiving and/or freefly skills, the tunnel provides a fun opportunity for longer practice time in 'freefall', as well as immediate coaching feedback (and works out cheaper in the long run!). To get the most out of your indoor skydiving experience it matters where you go. There are a number of indoor skydive centres in the UK catering for all from complete beginners to the most experienced. Many experienced skydivers use indoor centres to refine their skills and practice for the real thing. As a beginner you’ll be given expert guidance. Throughout your flight, your instructor will show you how to control your body in the wind. Instead of jumping from a plane, you simply lean forward into the wind from a door in the side of the wind tunnel chamber, and you’re off. Follow your instructor’s guidance and you’ll be surprised at how quickly you feel in control of your flight. Pay attention to the pre-flight training, it will help you to get the most out of your experience. Skydivers usually book time with a coach to get the most out of their flying time. Whether you are hooked on indoor skydiving, honing your professional skydiving skills, or you’re a complete novice, you’ll need to know the best places to go for your body flight. As a beginner, the iFly centres are perfectly geared up to give you the best experience with fully trained instructors by your side. The fully qualified instructors provide a full pre-flight briefing and you’ll get to see a demonstration of body-flying techniques before you are kitted out for your own flight. If you’re a pro, iFly also offer coaching sessions, tunnel camps and regular events. Courses for skydivers and pro-flyers include Formation Skydiving, Freeflying, Vertical Formation Skydiving, and Dynamic Flying. The iFly indoor skydiving centres are based in Basingstoke, Manchester, and Milton Keynes. The centres are equally suitable for beginners or experienced flyers. Basingstoke: 14ft diameter wind tunnel. Situated close to the centre of Basingstoke, this great activity centre also offers a small climbing wall and indoor skiing mat. Manchester: 14ft diameter wind tunnel. Situated in the heart of Trafford City. Milton Keynes: newly refurbished centre with a 12ft diameter wind tunnel. Situated directly adjacent to Milton Keynes shopping centre. There’s also a new iFly 12ft diameter wind tunnel currently under construction at the Bear Grylls Adventure Park in Birmingham due to open in 2018. Located just north of Bedford at the Twinwoods Business Park, the Twinwoods Adventure Centre offers multiple activities, including an indoor skydiving wind tunnel. There’s also a hotel, restaurant and a leisure centre with a pool, gym, sauna, and steam room. As well as indoor skydiving, the adventure centre offers a Flowrider surfing simulator, archery, a climbing wall, racing car simulators, a shooting alley, and a salt therapy cave. Technically the North London Skydiving Centre is a real jump-out-of-a-plane skydiving facility. Based at Chatteris Airfield, near the town of March in Cambridgeshire, the school is the only skydiving club in the UK to have its own wind tunnel. 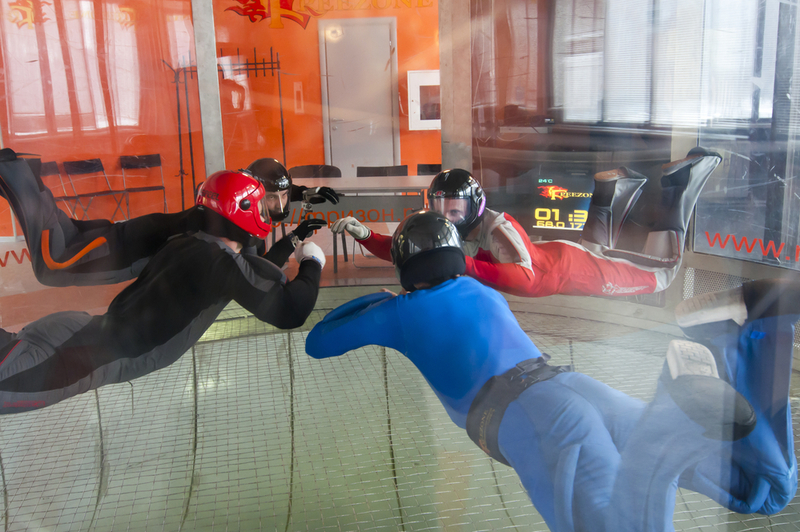 While the wind tunnel isn’t open to those not partaking in an actual skydive, guests accompanying a skydiver to the airfield (who have paid a £12 entry fee) can book in and have a mini-flight experience in the wind tunnel on the day (subject to availability and only bookable on the day itself). Who knows once you’ve got the bug for indoor skydiving you may want to up your game and try the real thing, or if you already skydive, use the opportunity to develop your skill set and train with qualified instructors. One of the many services that XDream provides is coached tunnel time at iFly Basingstoke. If you can’t stomach the idea of skydiving (even indoors), it doesn’t mean you can’t be a spectator. For the funny faces alone, it’s worth going to watch friends and family partaking in this sport. For the faint-hearted, most wind tunnels have spectator viewing galleries. But once you’ve seen how easy it is, you’ll want to have a go.